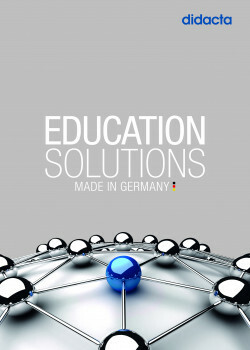 Global markets are of growing importance to the education industry in Germany. “Made in Germany” has long been synonymous with highquality when it comes to education concepts, innovative curriculum developments and products originating from the heart of Europe. The Didacta Association fully supports the German education industry. “didacta international” is our contribution to the global presence of German education enterprises, enabling them to penetrate new markets, especially in threshold countries. We are active at many different levels to make sure that education is one of Germany’s top exports. Conferences, professional workshops and discussion sessions organized to complement our partners’ trade fairs increase the visibility of the German education system and generate synergies. Expansion of the international network of the Didacta Association allows members to make new contacts with education professionals who can help “open doors” to many business opportunities. Market information and materials such as export catalogues are also important elements for promoting a wide range of education offerings. We guide our members to new markets and make it easier for them to launch their businesses with success. In the didacta international Committee members also have an opportunity to actively shape our approaches to the international education scene and thus contribute to the successful positioning of the German education industry in various foreign countries. Our export catalogue: A clear and comprehensive compilation of offers and services within the German education industry.